Thank you to Andie S. for hosting our annual Christmas picnic on December 17. Your home was so pretty with all the decorations and Christmas lights. We all got into the spirit of Christmas. The Chinese auction with the ornaments was a heck of a good time. We had a frosty night but warm fellowship. We took a picture of Andie’s large single-stitch afghan, which is her first contribution to the prayer shawl inventory. Someone will be very grateful to receive it. There was a great turnout for the last mid-day Stitching Circle on December 19 (Deb H., Maureen H., Ele B., Edna A. and Emily S.) And since we met on that day, Maureen completed a multi-colored baby blanket with a shell stitch border to compensate the one we gave to her granddaughter, Ashlynn, following brain surgery. We are so grateful that things are looking up for this little one. The mid-day stitching circle will be on vacation until mid-March. Happy Stitching to all in the New Year and blessings to all. Fellowship of Families (families with children, from birth to 5th grade) will hold its next event on Saturday, January 25 at 6 pm in Martha & Lynn R.’s home. Everyone attending is asked to bring a pot of chili and a side dish/dessert to share. There will be a brief meeting for the adults and a craft for the kids. Join us for a fun night in fellowship. RSVP to Cocoa or TJ M. if you plan on attending. When I tell people that I am the pastor at Good Samaritan, I am often asked, “Where is that church?” I explain to people that it is right off of Great Mills Road near Route 5 and they are surprised that they have never noticed it there. Maybe you have had that experience too. Or maybe you’ve invited people to church and had to carefully explain to them to drive past the first two buildings to get to the actual sanctuary. Our mission is to be a light to the community around us, but it’s hard to do that when people can’t easily find us. However, we are excited to share that this is about to change. Thanks to a generous donation or two specifically for this purpose, Good Sam will soon have brand new signage. Starting about Christmas Day, we will have a new sign on Great Mills Road pointing to the life we share behind those trees. The message “We Welcome All” will be prominently displayed along with the ELCA logo, for those who are looking for a Lutheran church. The bottom third of the sign will have a double-sided LED message board capable of displaying letters of a variety of sizes. Each message will remain approximately 10 seconds and will fade to the next message. The sign is capable of up to 99 messages at a time. Each LED is also capable of displaying in the colors red, green, and amber. 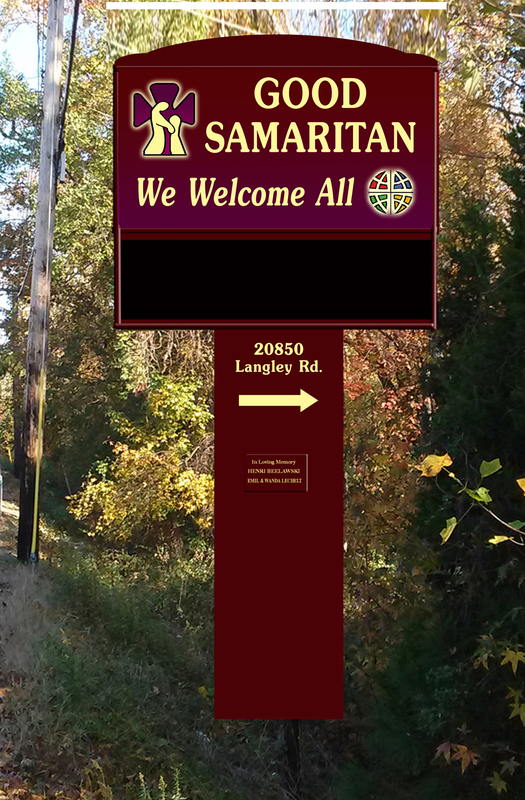 An arrow on the upright portion of the sign will point in the direction of the church and the address on Langley Road will be displayed in large letters. This new sign on Great Mills Road will help people know that we are here. In addition to this sign, we will also be getting several smaller labeling signs on our campus to help people know how to find the program or building that they are looking for. Where will these signs be? At the bottom of our driveway where Great Mills Road meets Langley Road, we will have a new hollow core sign where the old preschool sign used to hang. It will read “Good Sam Campus” with bullets for “Soup Kitchen,” “Food Pantry,” and “Church” with an arrow confirming that this is the turn. As they approach the Soup Kitchen, a sign at ground level will read “Soup Kitchen” with the St. Mary’s Caring logo beside it. Our logo will be smaller and in the corner. As you approach the Disciples’ Den, you will see a sign that identifies both the Food Pantry as well as the Disciples’ Den meeting rooms. As you look straight ahead from beside the Soup Kitchen you will also see a sign (in the first flower bed) that says “Good Samaritan” with an arrow pointing to the church building. Calling all volleyball players, fans, or supporters! Good Sam Volleyball Team t-shirts can be ordered for $6.50 now through Sunday, January 12. If you are interested in purchasing a shirt please either place your money clearly marked “Volleyball shirt” with your desired size(s) in the collection plate or give it to Mandy R.
Questions – email Mandy or the church office. The church office will be closed Wednesday-Friday, December 25-27. The following week, it will be closed on Wednesday, January 1. A weekly Bible study began in early December at Panera Bread on Tuesday mornings at 7:30 am. No special materials needed, just your Bible. We read/studied the book of Galatians in December, and the book of Ephesians in January. Join us as we read the book of Philippians in February and Colossians in March! –Gail W.
How will you begin the year? Here’s your invitation to start your 2014 journey as an adventure! Beginning in January during the Sunday School hour, we will have seven sessions intended to help you grow your faith and believe God to do the impossible in your life. Our adventure has been and is being prayed for! Angel Tree Contributors – Thank You! Thank you to everyone who participated in the Angel Tree this year. We gave The Charlie Brown Christmas Book, hot cocoa, and cookies to 23 families with presents going to 48 children. Thank you to the 5th and 6th grade Sunday School students who helped put together the family gifts. All the families were very appreciative! It is a worth while activity to reflect on the Christmas Story from a devotional point of view. Repeated again and again in this drama is the theme of God’s working through the lives of specific people. The story suggests that when God comes to work in our lives, somewhere in the process we become prepared to welcome and receive that activity. The Angel Gabriel comes to Mary (Lk 1:26-38) to prepare her, but already we can see her heart is ready for this activity of God. She goes to visit her Cousin Elizabeth and they together share a vision for God’s working among them. An Angel appears to Joseph (Mt 1:20) encouraging him to not fear to take Mary as his wife. The Shepherds have news shared with them and lo and behold, they indeed discover the sign that would confirm for them the truth of what they had heard: They found “Mary and Joseph and the baby lying in the manger.” Even the sign (the baby in a manger) itself seems to suggest that in Jesus, God is already working in a new and different kind of way. Somehow this nearness of God in just right for us, but also requires our welcoming of it too. Perhaps this Christmas God is also working in our lives to prepare us for special work that is just right for us each of us to do. Learning to see God’s activity is the work of faithful people of every time and place. Mary and Joseph, the Shepherds and the Magi might be great examples for us as we too ponder in our hearts what God is up to today. First, a big thank you to the November fellowship team—Diane R., Christa B., Diana K., Cocoa M., Cindy G. and Edna A. There were so many seasonal pumpkin and apple cakes and breads that were truly gifts to our fellowship table. And we also have to mention the crackers and cheese which are becoming a favorite. We also would like to thank Thrivent for providing most of the fellowship treats on November 17. They were greatly appreciated. THANKS to everyone who will be contributing some delicious and yummy cookies for the annual Christmas cookie Sunday on December 15. We know it’s a busy time of year and we are grateful for your donation. The Good Sam cookbooks are on sale and would make a wonderful gift for a neighbor, friend or co-worker. On January 5, we will celebrate Epiphany Sunday. That means Shawnna and Gloria M. (who found the Christ child last year in the cake) will be providing the King’s cake for our enjoyment.